Silk is made from worms that are “fattened” with mulberry leaves then they move their heads in a figure 8 motion spinning silk around themselves. In about 2-3 days the cocoon is complete and the silk cocoons are placed in boiling water to loosen the silk fibers. The fiber is then unwrapped from each cocoon. 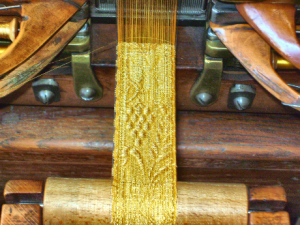 The silk thread is white and very fragile so it is dyed and three to ten strands are twisted together to produce one silk thread used in commercial manufacturing of fabrics and trim. The following video shows how the silk is unwrapped from the cocoons in a Chinese factory. Once the silk is dyed or to get the gold and silver colors it was painted or dipped in gold or silver, it is ready to be made into fabric or trim. Lyon, France was famous for its production of silk trims and fabric. Most people don’t think of trim but it was used extensively in the decorations of many nations soldier’s uniforms. Trim was also used extensively by the catholic church to adorn the priest’s clothing. Save up to 70% on Textbook Rentals, plus Free Return Shipping at BarnesandNoble.com! Thanks for sharing the video! This will be great for us to share. I know some of our customers are curious and want to learn more about how silk is made.